It was Friday October 21st 2016 in Northern Scranton, Pennsylvania and rain had decided to be a tease all day long. The announcement was made at 1pm that the show must go on despite whatever Mother Nature had in store. Unfortunately, the rain decided to come pouring down at random times and sprinkle at other times with a cold wind blowing through the trees all night long. Were the actors at home taking the night off snuggled in their blankets watching movies? NO! They were outside all night in full costume, soaking wet and scaring the hell out of anyone and everyone they could. What these actors do is impressive even without the obvious discomforts of cold, wet evenings. The first actor you see on the hayride is a contortionist that bends her elbows in unnatural ways right on the wagon, inches away from you. Their carnival has twin girls skipping and dancing in a haunted playground and effortlessly reciting their own nursery rhymes at the same time like they are one being. A zombie crew that attacks the wagon at one minute and suddenly starts… well, let’s just say it’s thrilling. They even have carnie game workers in the middle of the attraction that get you to play their games, but you’ll never win. The newest attraction, “Sector 13,” is guarded by what I can only describe as demented, wasteland warriors. One of the first things you will see when walking up to the attraction is the few guards patrolling on top of this new attraction. They shine spotlights and lasers and even a prop machine gun into the crowd all around this massive jungle of metal. All I can say about the actors inside Sector 13 is that they are legitimately crazy. You are thrown into a world of what might be the closest thing to organized chaos and they are loving every second of it. Crazy doctors, suffering patients and mutated lab experiments are just a few of the maniacs you’ll meet in there. 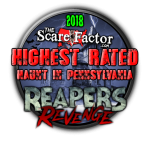 Every actor at Reapers is very passionate and dedicated to their character and performance and they let it show no matter if you are the first, middle or last customer of the night. I was fortunate enough to get a tour of the Reaper’s Revenge makeup and costume department. A very impressive and well organized setup. Every character in the show wore custom-made costumes that represented their story flawlessly. Zombies had dusted, bloody and ripped up clothes and mad doctors had creepy, leather surgical aprons and face masks. The most impressive makeup jobs were the lab experiments you will encounter inside Sector 13. Mutations come in all shapes and sizes and you won’t know what to believe. The only masks I remember seeing in the whole attraction were the watchers on top of Sector 13 and maybe a few of the crazies inside. Neither the masks or costumes were items you could easily find at any Halloween store. The masks in particular were all heavy duty mechanical or industrial masks painted and altered to customize the characters. Paul Kotran, the owner of Reaper’s Revenge, turned my already-awesome night into one of the best nights of my life. After we went through all the attractions, we met up with Paul in the “VIP Lounge” for drinks and a much-needed, warm fire. Drinks, snacks and a warm fire are available every night for all guests. There is even a stage performance throughout the night and fire dancers were performing on the night I attended. 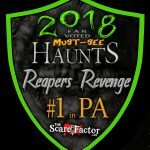 Reaper’s Revenge is easy to find right off the highway, but far enough into the country to give you the sense that you are in the middle of nowhere. Although most publicity will talk about how it is a Scranton, PA attraction, take note that it is actually in the town of Olyphant across the street from Scott Green’s Golf Club and in the morning shadow of Hubbard Mountain. There are plenty of parking attendants to easily guide you into a safe parking spot. I can’t say there are many lines I don’t mind waiting in, but Reaper’s Revenge does it right. 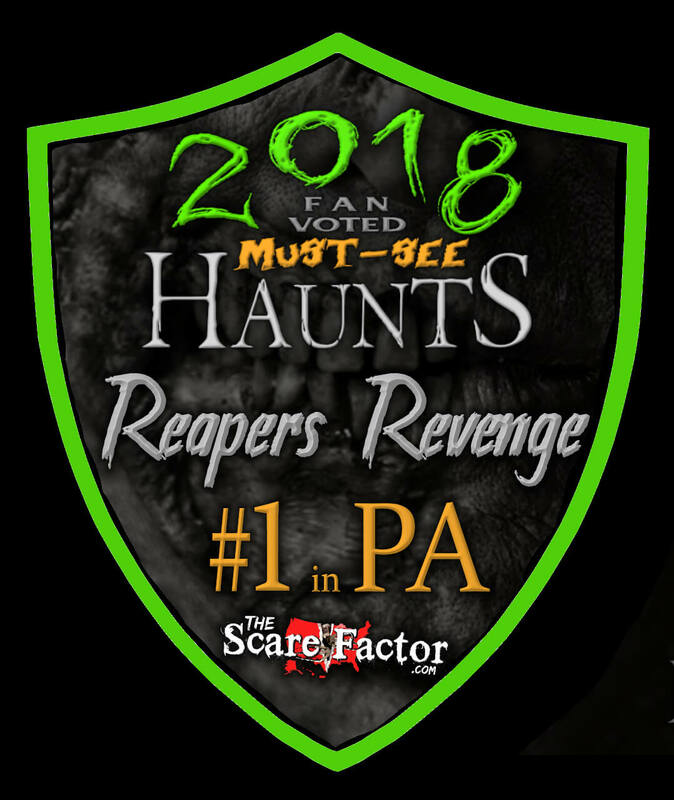 An actor here and there is OK every once in awhile, but at Reapers’, you’ll get a giant projection screen playing a full-length horror film. It just so happens that my wait in 2015 caught the beginning of Pet Sematary and 2016 caught the tail end of Pet Sematary. I believe projecting the full-length film is much better than any other kind of line entertainment. Actors can be fun, but repetitive when you have to be there for hours. Clips of films are OK too, but they don’t immerse you into a story to take your mind off the fact that you have to wait for hours. Stage performances are part of what you paid to see, but if it’s your time to go in, you end up missing out on it. At least with a film you can watch the rest at any time you want. Alfred Hitchcock’s The Birds was playing as well and I’m glad they showcase some of these classics to our younger generations. The gift shop is stacked high with great merchandise such as hoodies and caps and t-shirts in all sizes. Towards the end of the night, Paul was kind enough to give us a backstage tour of Sector 13 and took us to the top tower. We looked over the forest and saw fire explosions, strobe lights and multi-colored fog bursts. Throw in the sounds of screams and chainsaws and it was haunt heaven. The entrance to Reaper’s Revenge has a special spell cast over it and you will feel it the second you see it. Like most attractions with an arched entrance way and their name carved out in iron hanging above, you stop yourself for a minute or two… either to admire the beauty of it or think twice about entering. Reapers’ name is illuminated by torches and the massive iron gate makes it hard to question how real things could get on the other side. Blue Oyster Cult’s “Don’t Fear the Reaper” plays in the background to ease the tension for those too nervous to go forward… or to enhance the tension (depending on how you listen to the classic tune). I kind of feel bad for the security guard posted there all night listening to the song hour after hour. It’s a good 150 yard walk from the entrance to the ticket booth. I couldn’t see the ground I walked on but there were little tiny torches to help guide me in. On both sides of this barely-lit trail are two swamps with green and blue lights reflecting off of the surfaces. If you are walking in alone, the feeling that something is about to get you is intensified. The music fades slightly as you move away from the entrance and will pick up again as you creep forward to the ticket booth. For a brief moment, the elements of the dark woods consume you. The only time I can recall any music being used was during a Michael Myers scene and another “thrilling” scene on the hayride. I want to say the majority, if not the rest, of Reaper’s Revenge sets the uneasy tone with sounds of buzzers, alarms and electric bolts… things of that nature. Paul Kotran is very proud of his sound management. It takes talent to bring customers the sights that lay within Reaper’s Revenge, but it’s the sounds that bring you into scenes. Most of the time, I couldn’t tell where the speakers were; it was like I was wearing headphones and I could hear and distinguish everything crystal clear. The Pitch Black attraction is by far the best I have ever been in. Most total-blackout attractions are nothing more than a maze through plywood walls, but Reaper’s made sure to make it much more than that. The plywood wall can suddenly becomes hairy or sticky, the floor turns into mush, actors grabbing your ankles; the place is insane. The way that Sector 13 has those wasteland-style guards patrolling is an amazing touch. Inside, I was exposed to all kinds of crazy sights and sounds. The place is almost designed to give you anxiety. They get you in fast and force you to do things and make you watch things, even if it’s your friend getting dissected on a table. There is no mistaking that going into Sector 13 might have been a mistake… in a good way. The hayride doesn’t follow any kind of storyline… just like practically any hayride. Just get ready to see some amazing scenes and actors give it their all and more to entertain you. The carnival of lost souls is, you guessed it, a carnival. I’ll mention again how much fun it is to have carnie game attendants letting me play actual games. They also have a fun house, a fortune teller and even a roller coaster. Sector 13 is a little harder to explain. I like to think of it as a compound during some kind of apocalypse that either tricks you into thinking it is a safe haven or has captured you as prisoners. Then you are cleaned and examined and moved to a testing lab where they are trying to create a super soldier and fail miserably. In reality, they have turned people into horrible mutants that are out for blood. That is what I like to think, but apparently, after a few clicks on the Reaper’s Revenge website, I now know a completely different story that works just as well. The point is, Sector 13 has a great theme and it carries very well throughout the attraction. Being an avid haunt traveler, I spent most of my time at Reaper’s in awe and gawking over how amazing everything looked and felt. The strangers around me did the screaming for me. If the sights and sounds and even the smells aren’t enough to scare the bejesus out of you, then maybe this will: This Haunt WILL Touch You! It could be as gentle as a light brush of the cheek to as violent as dragging you by your foot across the floor of the hayride. I was locked in a cage at Sector 13 for a moment while my friend was getting examined on the table. All bets are off in Pitch Black since there is no way of telling who or what is touching you… or what or who you bump into. I have too much fun laughing about the tears of fear streaming down the guests’ eyes, but there were times where I felt danger could easily be right in front of me. Ticket prices are $35 for general admission to four state-of-the-art attractions. For an additional $25, you can purchase a VIP (skip the line) pass. To go through the hayride, carnival, dark maze, and Sector 13 took me close to one hour and forty minutes and there was never a dull moment. I could even say that the waiting line for the hayride is a good source of entertainment. With the gift shop, food trucks and a fire pit next to a stage performance, this place is absolutely fantastic. 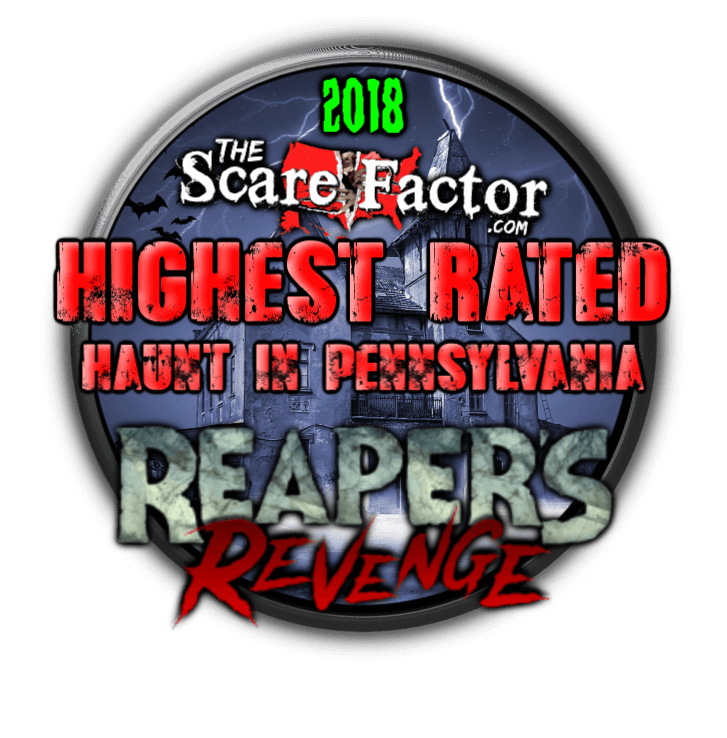 The uniqueness, creativity and attention to little details is what sets Reaper’s apart from other “big name” haunts. The achievement in capturing the different styles of great haunted attractions is what keeps me coming back. If anyone out there doesn’t know about Reaper’s Revenge now, they will soon. This place is easily one of the most fun and entertaining venues I have ever experienced and you will not be disappointed.